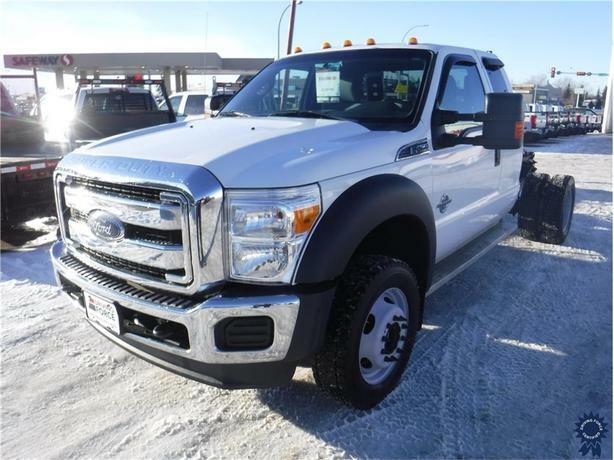 This 2016 Ford F-450 Super Duty XLT Supercab 6 Passenger 4X4 DRW Cab/Chassis Truck comes with a 162-inch wheelbase, 60-inch cab-to-axle, 6-speed automatic transmission with SelectShift, manual transfer case, limited slip with 4.10 axle ratio, 19.5-inch forged polished aluminum wheels, cloth 40/20/40 split bench seat with recline, electronic-shift-on-the-fly, trailer brake controller, transfer case skid plates, heavy-duty front suspension package, spare tire and wheel, 6-ton hydraulic jack, rapid-heat supplemental cab heater, block heater, 175-amp alternator, towing with harness, HD shock absorbers, front and rear anti-roll bars, firm suspension, hydraulic power-assist steering, manual extendable trailer style mirrors, deep tinted glass, chrome grille, reverse opening rear doors, cab clearance lights, perimeter/approach lights, AM/FM stereo, SYNC Communications and Entertainment System with voice activation, USB port, 911 Assist, steering wheel mounted controls and microphone in headliner, manual air-conditioning, cruise control with steering wheel controls, three 12V DC power outlets, Bluetooth for phone connectivity, upfitter switches, front tow hooks, manual locking hubs, 151.4-litre fuel tank, and GVWR rating of 16,500 lbs (7,484 kgs). The 6.7-litre Power Stroke Diesel V8 engine provides 300 horsepower at 2,800 RPM and 660 lb-ft of torque at 1,600 RPM. Touch base with us to discuss purchasing or financing options that are right for you and experience the difference you will only find at DRIVING FORCE Vehicle Rentals, Sales and Leasing.